Last week I wrote about Reading Workshop; this week I'm focusing on Writing Workshop. 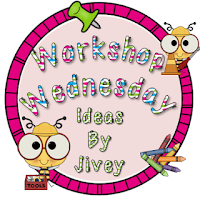 I'm linking up with Ideas by Jivey for her Workshop Wednesday. I love teaching writing. That hasn't always been the case, even though I've always been a writer myself. About 20 years ago, I attended a writing institute that change me completely as a teacher. If you ever have the opportunity, I highly recommend that you devote the 3 weeks and participate in an Abydos Learning International (formerly known as The New Jersey Writing Project in Texas) institute. One of the things I learned about during my writing institute is the importance of pre-writing. Give a kid a pencil and a piece of paper and tell him to write, and most likely he will complain that he doesn't have anything to write about. It is so worth it to spend some time up front to gather ideas. I love using trade books for this purpose. I personally like to start the year off with a personal narrative. Most of my students come to me without much writing experience. Research teaches us that students are more likely to work hard on something that has personal meaning to them. So I use this book to help gather seed ideas students can use for that first piece of writing and for the rest of the year in writing workshop. Click on the picture to read about the book at Amazon. First I read students the book. Then we use listing to generate a lot of memories. Students make a list of people who are important to them. Then next to each person's name, they write a memory associated with that person. For example, I would list my Dad and then write "singing while Dad played the guitar" as my memory. It is incredibly important for you as the teacher to model this for the students. Next each idea (not developed at all - simply the idea) is written on a strip of paper. 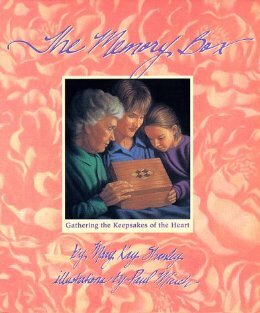 Finally, we use card stock or construction paper to fold a memory box to hold the ideas. If you Google origami box, you will find many sites with instructions. To read more ideas for establishing writing workshop, click on graphic at the top of the page to go visit Ideas by Jivey's linky! I love this idea and that's actually a book I don't have!! :) I'd love to win it! :) thanks for linking up! This book looks awesome. I love your idea. Thanks for the opportunity to win! Great idea. Sounds like a wonderful book. :) I would love to win! Thanks for the opportunity. This looks and sounds like a great book that I would love to have in my classroom library. I am always looking for inspiration for my special students. We did Me Bags this year and they loved them. They are writing about the items they brought in and why they are special to them. This book would enhance this lesson. Thanks for hosting the giveaway! Great idea for helping students generate ideas for writing! Would love to win the book. Love this idea. I am starting Writer's Workshop soon and will definitely use this idea. Thanks for sharing. It sounds like a great book for generating ideas for writing! Thank you for the giveaway! Thank you for sharing this great book...and for the giveaway! This year, I used The Best Story by: Eileen Spinelli and completed a heart map of things we love. Will definitely add this book to my list! Observation/Infer; each student would bring out one item (item or picture if the item was too large/valuable to bring in), the students wrote down what the item was and then they had to infer why they thought the item was special to the person who brought it in. Very successful activity to begin and now we are going to use the book to go even further! Thanks so much for the book!! By the way, I love your blog!